Produktinformationen "Go Direct® Acceleration Sensor"
Collect acceleration, rotation, and altitude data in the classroom or in the field. 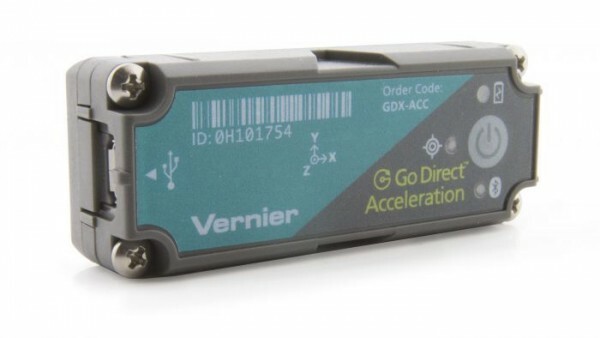 Go Direct Acceleration connects wirelessly via Bluetooth® or wired via USB to your device. This 3-axis acceleration sensor has two acceleration ranges plus an altimeter and a 3-axis gyroscope. Measure helmet impacts in concussion-related investigations. Slip it into your pocket and pirouette or ride a half-pipe. Zip-tie this accelerometer to your bicycle or affix it to your lab cart without any dragging cables. Weiterführende Links zu "Go Direct® Acceleration Sensor"
Garantie(Jahre) "Go Direct® Acceleration Sensor"
Weitere Info "Go Direct® Acceleration Sensor"
Kundenbewertungen für "Go Direct® Acceleration Sensor"